As usual, I have left writing the match report until the following day, as experience has shown my feelings are often a bit raw after the match and sometimes it is difficult to keep a sense of proportion, win, lose, or draw. In this case it was a match lost, that Saints really ought to have won. Who would have thought, when we were in the depths of despair, back in the dark days of pre-Liebherr Saints, that one day we would be playing one of the iconic sides of European football, at what surely must be one of the most impressive of stadiums and yet feeling cheated that we didn't beat them with some ease. The team lined up, pretty much as expected, given the number of injuries, particularly with three of the main four fullbacks out. This gave young Sam McQueen his first team debut at Right Back - in the San Siro. No pressure then. At least Inter's tactics helped McQueen, whose strength is going forward, as they seemed content to soak up the pressure and tried to hit Saints on the break. Sam soon settled into his new role and was marauding down the left flank and putting in some great crosses, just as he did when he came on for the injured Targett during the Burnley game last Sunday. Forster was largely reduced to the role of spectator during the first half, only having to clear up a couple of mistimed back passes from the usual suspects. So, while the defence was more, or less under control, the midfield of Højbjerg, Romeu and the impressive Ward-Prowse were completely in control. Up at the sharp end Tadić was looking slightly frustrated, while Long just didn't look fit and Rodriguez looked less than sharp and in need of more game time. The end result was frustrating to watch as chance, after chance, after chance was created, without any end result. To be fair to Saints, the Inter goalie, Samir Handanovic went on to have an absolutely blinding match. For me, he was a clear Man of the Match, as he pulled off several saves, including one point blank stop from a van Dijk header in the second half. Handanovic was beaten once though, when Jay Rodriguez thought that he had headed Saints into the lead, only to find that the referee had already blown for some infringement. 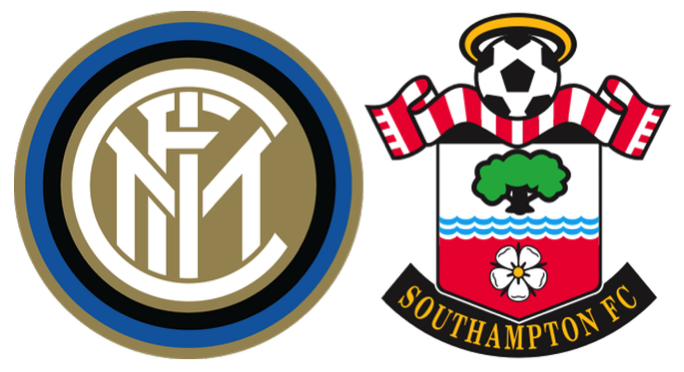 At half time, there was much muttering whether Saints would rue all those missed opportunities, but the second half pretty much carried on as before, albeit with Inter gradually seeing more of the ball. Shane Long had been replaced by Charlie Austin, just after the start of the second half, when it became clear that he had a hamstring problem (Another International player injured!). The game defining moment came just after 65 minutes when Inter, completely against the run of play, scored with their only shot on target in the entire match. It was a cracker of a shot from Candreva and a worthy match winner. Tadić and Rodriguez gave way to Boufal (for his Saints debut) and Davis. In between the two substitutions Inter had Brozovic sent off for a second yellow, but to be honest he could well have been dismissed for either of the two dreadful tackles for which he was shown a yellow. None of this made any difference, as Inter wasted time and ran down the clock, something Italian sides are rightly renowned for. So, with three of the six matches played Saints are now in third place on four points. In the other Group K game, Sparta Prague defeated Hapoel Be’er Sheva 1-0 in Israel, effectively throwing the group wide open. All to play for then. Saints will quickly have a chance for revenge, as Internazionale are due at St.Mary's on Thursday, 3rd November for the next Europa League, Group K fixture.